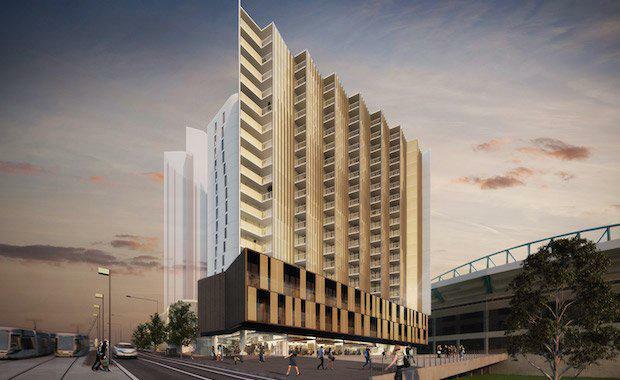 Construction has commenced on the 19-level hotel and residential tower, M Docklands located on the concourse of Etihad Stadium Gate 7 in Melbourne. The high rise will house a five-star hotel from level 2 to level 5 and 186 residential apartments on the remaining floors. Australia’s leading accommodation provider, Mantra Group, will be managing the hotel component under the Group’s luxury Peppers brand. will feature 87 guest suites accompanied by an on-site restaurant, pool, gym and dedicated lobby with 24-hour reception and full-service concierge. Constructed by Hamilton Marino, the hotel's amenities will also be available for residents to use. The apartments were priced from $355,000 for a typical one-bedroom apartment, $494,500 for a typical two-bedroom apartment with car park to $2,350,000 for a top-floor customised penthouse. “We have seen renewed consumer confidence in the property market, especially in the Docklands precinct. It was simply unaffordable to buy a property in Docklands; however since our now successful launch we’ve definitely seen a shift in the overall pricing structure of prime real estate simply by looking at what’s happening in the precinct, it is obvious that Docklands will become the future economic and lifestyle hub of Melbourne,” said Mohan Du of Capital Alliance. said this was an exciting project for the Peppers brand and part of a strategic focus to grow its CBD network. reports that the development is now almost sold-out, with only 15 out of 186 apartments left for sale. The building’s commercial and retail units were also quickly snapped up before the official public campaign commenced. Construction is due to be completed in April 2016.